My dear friend and crafting soul mate, Teresa, told me recently that she was making rag quilts as a way to bust through her endless fabric stash. 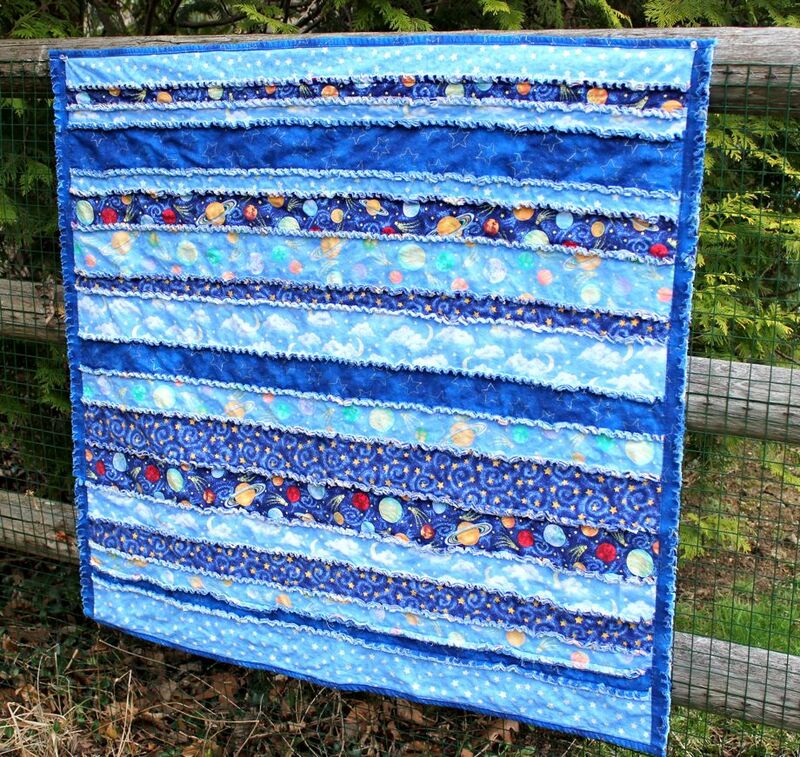 Although the idea of reducing the countless yards of fabric that I have neatly tucked and folded in plastic bins was tremedously appealing, the rag quilt idea just didn’t do it for me. That is…until I saw the pattern for this rag quilt in a Colorado quilt shop that I visited recently and, without warning, the “rag quilt” light was lit in my head and it was all I could think about. 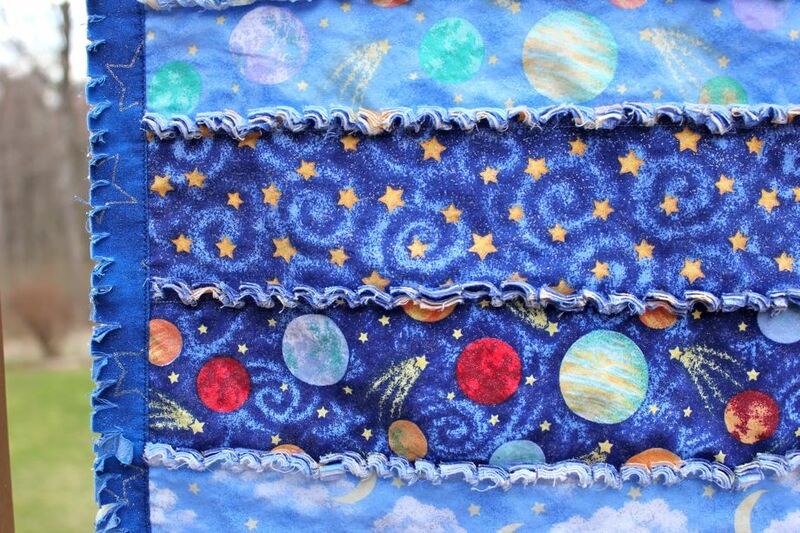 So, last night, I hit the bins and pulled out this collection of fabric….moons, planets and stars. This fabric has been around for QUITE some time and, since I was totally ready to trash it, I thought I’d give it one last go and use it for my first rag quilt. 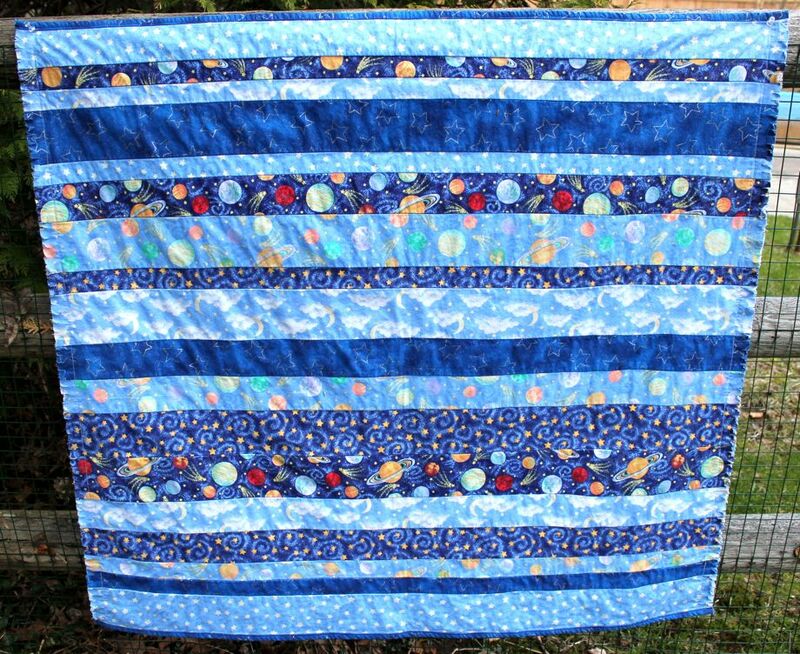 Rag quilts are so easy to make, and I found great directions here. Mine is a wee bit different, as I did not sew a center line down each strip, and my strips were 2, 3 and 4″ (a little narrower than the tutorial instructs). I cut and stitched the quilt in under 4 hours (that included clean-up time and a biscotti break), and I snipped all those seams the next morning. (I’d be lying if I didn’t tell you that the snipping is a huge pain in the…) I threw it into the washer and dryer, and those washed edges made such a pretty ruffle. And the back is almost as pretty as the front…which every quilter knows is mighty important. The finished quilt measures approx. 40″ x 42″, and I have to say that I think it’s adorable, and a great way to give your last-chance stash a new life. Hey, City Mouse, welcome to my Country Mouse world! It IS adorable, and imagine how cute it will be under a little “picnicker” in your back yard this spring. PS. Fiskars makes a Softouch Rag Quilt Snip if you have any 50% coupons hanging around…just sayin’. My visit to your Country Mouse world was brief, but MOST enjoyable. With coupons in hand, or not, I will be buying those scissors and saving my aching fingers.